we work hard to attain customer loyalty through superior product quality, we are hookah / shisha distributors in Egypt low Prices and excellent customer service. we are shisha manufacture / hookah factory representative shisha stems hookah glass vase and other accessories. 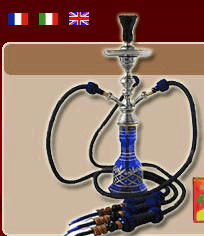 We are direct exporter of the finest Egyptian shisha and hookah accessories . We have been in the business long enough to know what a quality Hookah / / Nargile is made of. one filter can be used for 15 water pipe tobacco , or 10 packs of cigarettes. Egyptian-hookah .com promise you with the best quality and low price , we will supply you with nice designs and pharaohs stems for the collector lovers and excellent customer service. if you want to import hookah - water pipe from Egypt , we export direct from Egypt with low wholesale prices and high quality . we export to world wide USA , Japan , UK , France and many countries. export single hose hookah , double hose shisha, triple hose hookah . we promise you with the high quality and best price . There are so many different names for this unique smoking device. Some call it a , hooka ,huka, sheesha , nargile, narghile, hookah, shesha, shishas, chicha sheesha, nargila, Hubble bubbly , smoking water pipes or hookah. The (narghile as it is known in the Middle East) has been the standard of smoking for centuries in the middle east and Arab countries.